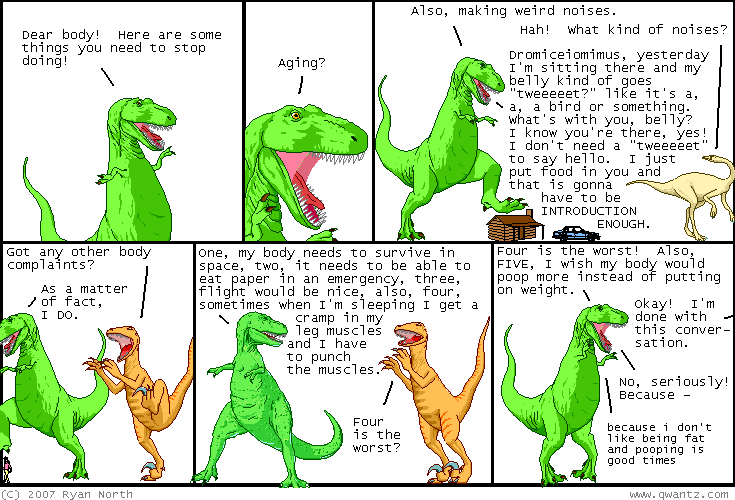 Dinosaur Comics - December 18th, 2007 - awesome fun times! December 18th, 2007: This weekend I thought, "I don't know enough about Spider-Man", so I spent a few hours reading Wikipedia about Spider-Man and now know I know a heck of a lot about Spider-Man. So that's something! One year ago today: panel five's dialogue of 'public love and recognition' was originally typed as 'public love recognition', and yeah, i guess both would be pretty good to achieve.